Welcome to Project Life Tuesday 2014 If you are new to The Mom Creative, welcome. I hope you will stay awhile. I’m Jessica – wife to Matthew, mom to Elias, a silly and spirited five-year-old, and Adeline, a spunky two-year-old. I’m also a marketing professional, savvy deal finder, photo lover and memory keeper trying to juggle it all. The first Tuesday of every month, I share my most recent spread as well as host a linky for readers to link up their pictures/layouts. Some links are affiliate links. I decided to make it my goal to get through our trip to Disney (the beginning of April), knowing that I have SO many pictures from our trip that if I could at least get through Disney, I would be in good shape. 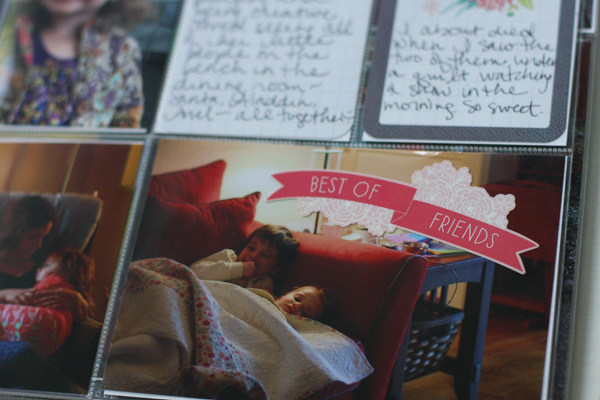 Did not resize (hardly) any photos, and developed all of them at once (I typically develop my photos at Walgreens , but this month I used Shutterfly . This makes things go SO much faster because you have to work with what you have. (And if a couple photos don’t work and need to be resized to 3×4, I do this on the back end. This happened with just two of the 100 photos I got developed.) 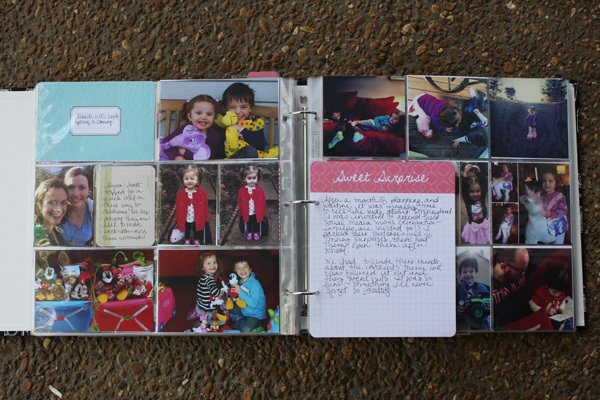 I did included two 6x12s and four 6x6s this month, but I printed them last time I worked on Project Life. I just knew that when I got to that point, I would want them big. Developed all my Instagrams straight to Walgreens at 4×4. Yes, this is way more costly than developing them at home (Instagrams run 39 cents a picture, but you can usually find a coupon to bring them to about 20 cents a piece), but the efficiency of not dropping them in photoshop is huge! Organized the 4×6 photos chronologically and then put them all in my inserts. I didn’t get hung up on one spread a week or everything fitting just perfectly. 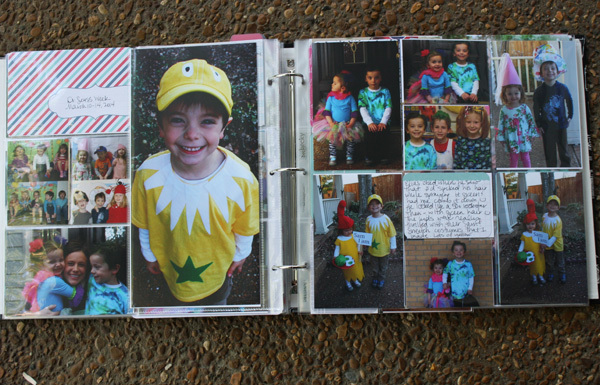 Some weeks it all worked out, some weeks the photos spilled on to two spreads. It doesn’t matter to me this year. 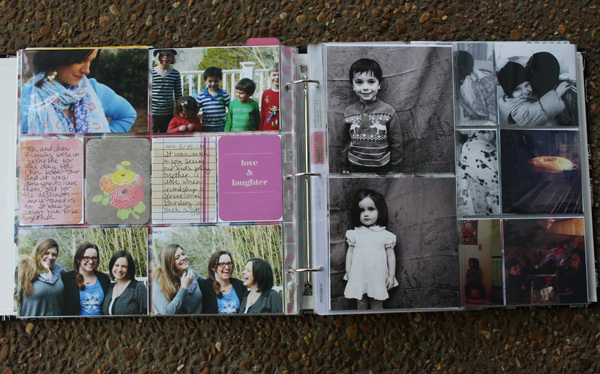 I am just happy to be printing photos, having them in an album and telling our family’s story. Then went in and added all the Instagrams. Then I did my journaling. 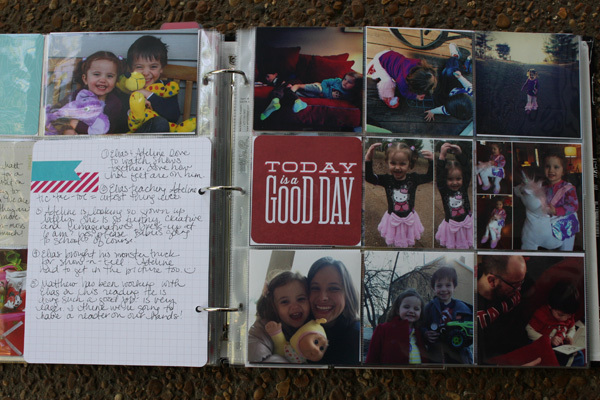 I still have several weeks of journaling to complete, but still have plenty of pages to share today! 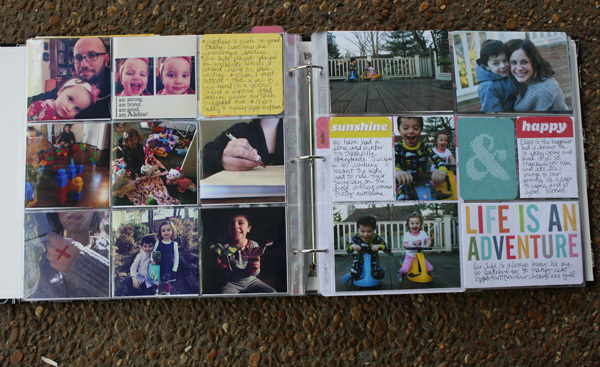 I used a ton of these pages with the nine 4×4 slots. 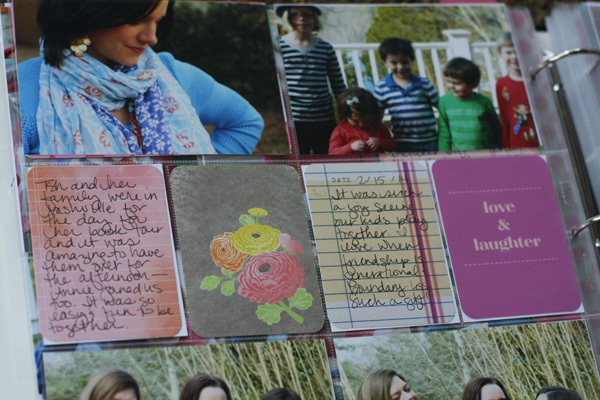 The 4×4 cards are all from the limited edition Just Add Color Project Life kit. I wish Becky would release more 4×4 cards. They are so handy! On the back of the card, I wrote about all the Instagrams. I love to add stickers to photos every once in awhile. This spread was completely dedicated to the kids’ Dr. Seuss week at school. I love how it turned out. 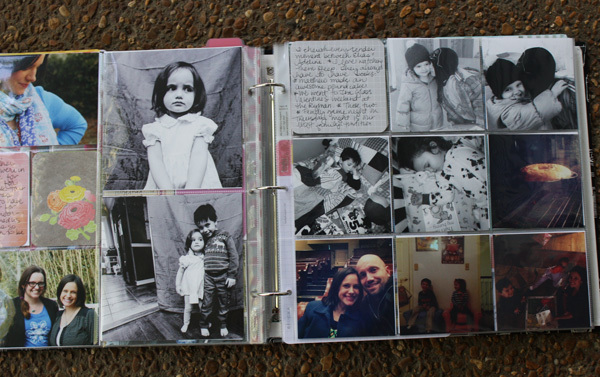 6×12 photos always pop in a Project Life album. I print them on my home photo printer and use 6 x 12 page protectors in my album . I am thrilled that I got so many pages done. Now I just need to tackle Disney. Your turn to link up. Also, just a friendly reminder to please remember to link back to The Mom Creative in your posts. Thank you! Good for you for getting caught up (to April at least!) 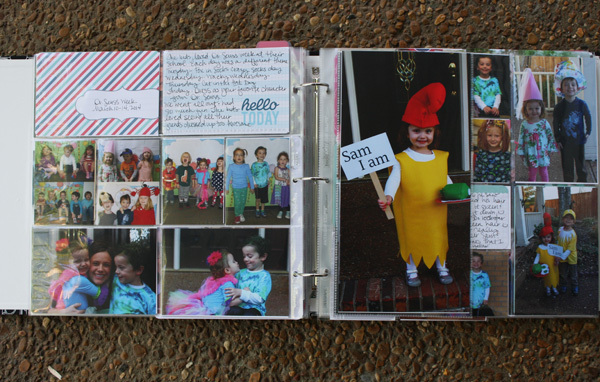 I had trouble getting started this year too….my January didn’t have very many pictures. One thing I’m doing better on this year is not getting hung up on the birthdays etc. 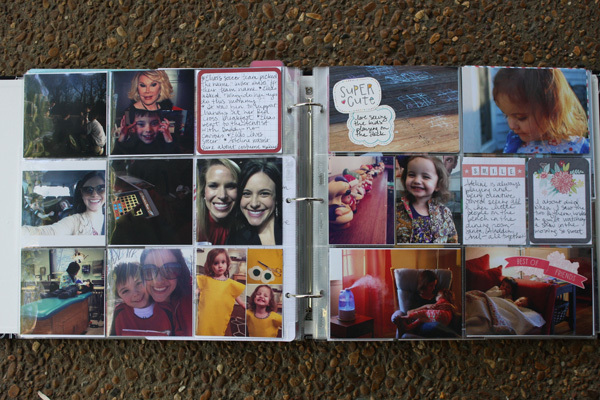 In past years I just have a 6X12 insert w/ the pictures thrown in (like in a stack) thinking I’d go back, but I didn’t. Let’s see if I can make it through the holidays this year. I got Easter done! I loved looking at all of your pages. It looks like you wasted no time in getting caught up. I really like the 6×12 pages and would love to print them out. My printer does not print out to 12″. Do you know of any printing places who will do this size? Thank you. I needed the push! Still going through March photos but will print this week and hopefully get March into albums. Awesome that you’re caught up! I don’t even have a baby album for an excuse, though I did cut down all of my ultrasounds and STARTED the baby’s first year album for the youngest…ultrasound pics are a start right?? 🙂 making March my goal! It took me forever to get our vacation scrapped… I finally got it done last weekend, thanks to the iNSD push to get layouts done at Big Picture Classes! I finally finished them all, and it was only 16 pages total… say what? 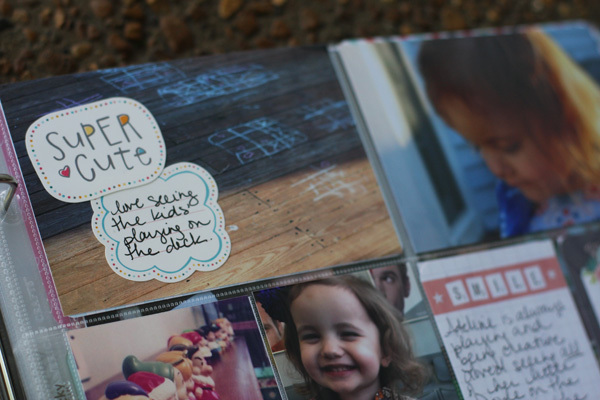 I’m going to go broke printing albums for each of my kids again with 2014. I’m at $130 per set for 2013 since I had well over 150 pages. OOPS! That’s why I have to get mine printed at Costco. Glad to see your Project Life posts back in play. I’ve missed them. Thanks, Yvonne. 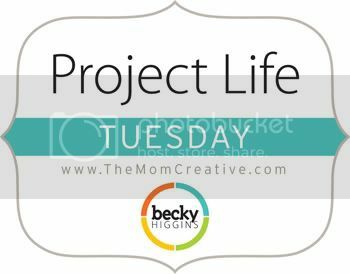 You’ll find Project Life posts on the first Tuesday of every month instead of weekly. It was getting to be too stressful doing them every week. Hope to see you again in June. Well done getting those pages done! I am hoping to do some more work on my album this weekend.